Android Theme: This theme is not affiliated with Google (Android). 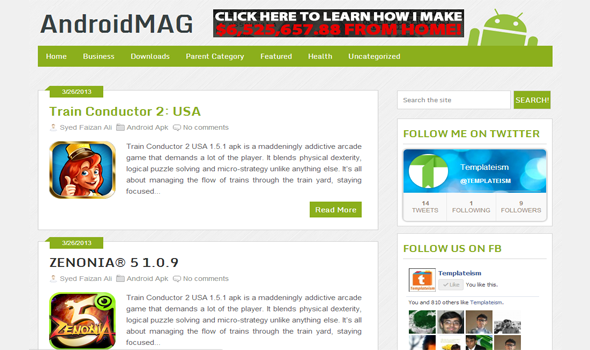 The main idea behind this theme is to help all smartphone lovers, and to motivate them to blog on Android niche. Multi-drop down menu: After receiving lots of request, we finally included a Multi drop down menu in this theme. To provide more flexibility, we have not used any jQuery file. In fact, everything works on CSS. SEO-Friendly: Like our previous themes, we have added an SEO plugin in this template. This plugin would help you in increasing your SEO score. It is already optimized for on-page SEO, so there is no need to do is manually. Author Box: We have also added an automatic author box, which would automatically derive the name of the author and would display his details at the end of the posts. We hope this theme would help you in giving a new shape to your website. We have added almost all gadgets, so there is no need to do lots of editing. If you liked this template, then do share it with your friends. thankzzz bro very nice template designed thankzzz........!!!!!!! Really Good One Bro Thanks..
what is header Image Pixels ? Add this CSS coding in your Template. First of all, congratulations! You have been done very professional templates! Could you make a template for blogs about animals, wildlife, nature? Thanks for requesting we would soon release a theme on wildlife nature. Where SHould I Add Coding Exactly ? Please help me, can you tell me how to edit that menu? Now do changes according to your needs. @ designer Team . It Works Thanks . What If I Want To Edit It Instead OF Removing IT ? Sorry We don't provide in-depth customization guide. hey Bro Please Do Make A blogger template for android games and apps like GOOGLE PLAY/PLAY STORE....!!!! Are you talking about Site Navigation because there are no Labels on the top? I like that! very nice theme! http://getandroidstuff.com/ make a blogger template like this website plzz this is mine humble request....plzz do rply for this...!!!!!!! Please help me, how to change green colour?